Thank you for agreeing to become an adviser for an undergraduate student organization! Here are some commonly asked questions about the requirements and responsibilities of student organization Advisers. Who is eligible to be an Adviser? Any AUA full-time faculty or staff member may serve as an Adviser for one or more undergraduate student organizations. What is the time commitment for being an Adviser? This is up to you. If you choose to attend all meetings and events, it could be 1-4 hours per week. If you choose to meet with the organization’s officers and attend occasional events, it could be as little as 1-4 hours per month. You may choose to allow students to drop by your office at any time or may ask them to schedule appointments. Your availability should be made clear to your student organization from the start. What are the responsibilities of an Adviser? This area is also flexible and should be discussed between the student organizations and yourself. Advisers are encouraged to attend student organization’s meetings and events as time allows, assist the student organization in transitioning and training officers, understanding university policies and resolving potential conflicts. There are no financial or monetary responsibilities associated with being an adviser. Advisers cannot make room reservations or any other arrangements for their student organizations; student club organizers should make arrangements for themselves based on the procedures designed for them. Please see the room scheduling procedure for more information. What are the benefits to being an Adviser? There are many benefits to serving as an Adviser. As a student organization adviser, you will have an opportunity to interact closely with a group of students, often in a capacity very different from your regular job. We hope that you will find the position rewarding because you will have a chance to make a positive impact on students. You may develop new skill sets that can assist you in your current jobs. Last but not least, being a club adviser, you will feel a greater connectedness to the university as a whole. Can I be held responsible for my student organization’s mistakes? You are there to help the student organization make sound decisions, but ultimately, the students are responsible for those decisions. As long as you are partaking in official student organization meetings or events, you are insured by the university in the role of an Adviser. Use your best judgment in deciding which activities you would like to attend. It is not recommended to transport students in your own vehicle at any time, as your personal insurance would have to cover any incidents. Can I be paid to serve as an Adviser? No, university employees cannot be paid to serve as Advisers. 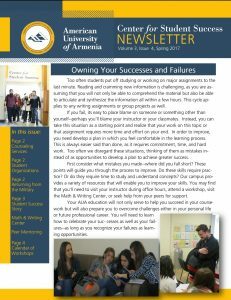 For more info, do not hesitate to stop by the Center for Student Success or just email studentsuccess@aua.am.